Why I Love To Hate The Gators. 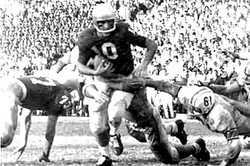 To see just why the Florida Gators have always and probably always will be the team I most love to hate, you have to take a trip back in time with me -- back to 1958. I know this was before many of you were probably born. But that is when my deep-seeded dislike for the Gators came into being. The 1958 season opened with great promise for the Georgia Bulldogs. They had finally broken an eight-game losing streak to those pesky Yellow Jackets and had the nucleus of their 1957 team back. They were expected to contend for the Southeastern Conference crown. When Texas dealt the Dawgs a 13 - 8 defeat in the season opener, it was looked upon as positive improvement. Texas was expected to contend for the Southwest Conference title and a possible National Championship in 1958. Fran Tarkenton had entered the Texas game in the second quarter and the previous season’s Tech game hero, Theron Sapp, had crashed into the Longhorn end zone to bring the Dawgs to within one point at 6 - 7. This was the first year of the new two-point conversion rule in college football. Coach Butts rolled the dice with seven minutes left in the game and went for the two. 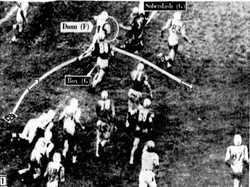 Tarkenton threw to Jimmy Vickers for the conversion and it looked like Georgia was going to pull off the big upset. It didn’t happen, but it seemingly gave an indication of good things looming down the road for the Bulldogs. Texas roared back to win the game 13 - 8, but Frances Tarkenton had made an impressive debut. Georgia would lose to Vanderbilt 21 - 14, to Alabama 12 - 0, and South Carolina 24 - 14 to start their season. Losses to Alabama 12 - 0, and Auburn 28 - 0 would follow later in the season. But the game I still remember to this day is that unbelievable 1958 Georgia- Florida game. The Gators would have a reasonably good season at 6 - 3 - 1 in 1958. Their losses were to LSU 7 - 6, Auburn 6 - 5. and Mississippi State 14 - 7 during the regular season. Ole Miss would topple them 7 - 3 in the Gator Bowl the last Saturday in December. It was a rainy, drizzly and chilly Saturday afternoon that I barricaded myself in my room with my little Zenith radio and listened intently as the pre-game festivities blared out over the air. Songs like “They call him Mr. Touchdown, Dixie, and Glory, Glory to Ol’ Georgia” were hit favorites on all the Georgia Pre-game programs and were prominent all afternoon even after the ball games. Around 1 p.m., Ed Thelenius, the Bulldog announcer from 1955 - 1965 would remind you to “imagine your radio as I am looking at the field and our lefts and rights will be the same.” Then it was time for the kickoff. The Bulldogs went into the game a 6-point underdog. By the time the game was over, Georgia had rushed for over 250 yards, passed for another 85 and held the ball for 41 of 60 minutes. Theron Sapp had bulled for a 5-yard touchdown to provide Georgia with a 6 - 0 halftime lead. Center Dave Lloyd had missed the extra point wide right as a bad snap resulted in a late ball spotting by holder Charlie Britt. The Gators had not picked up a first down and had 8-yards total offense the entire first half. The third quarter saw the Dawgs put together another time consuming drive as Sapp, Gene Littleton and Don Soberdash did most of the leg work. The end result was a missed 31-yard field goal by Lloyd. With three minutes gone in the fourth quarter, The “big toe from Cairo, Bobby Walden” punted dead on the Gator 25-yard line. Then “it” happened! The reason I have disliked the Gators for 52 years. The diminutive little quarterback, Dunn, rolled out to his left, cut between end Aaron Box and cornerback Don Soberdash and ran 75 yards to score. It was their first, first down of the game. End Billy Booker kicked the extra point that proved to be the deciding point in the game. Florida had managed only 3 first downs, 93 yards total offense and had the ball only 19 minutes in the game, but walked away with a 7 - 6 win. The Bulldogs would have earlier victories over Florida Sate 28 - 13 and Kentucky 28 - 0. They pulverized The Citadel 76 - 0 and rolled over Georgia Tech 16 - 3 in their last two games to close out a 4 - 6 season. The 1959 season would see Georgia go 9 - 1, losing only to South Carolina, and defeat Missouri 14 - 0 in the Orange Bowl. It appeared the 1958 season was one of learning to win for the Georgia Bulldogs. Dave Lloyd went on to a great career as a center with the Detroit Lions. Bobby Walden became an all-pro punter with the Pittsburgh Steelers. Charlie Britt ( Rams), George Patton ( Bills ), Theron Sapp ( Eagles ) and Nat and Pat Dye would also play at the professional level. Pat Dye, of course, became a successful coach for the Auburn Tigers. Now the Bulldogs are preparing to play those hated Gators in Jacksonville again. The game has been in Jacksonville since 1933. The Bulldogs have suffered some disheartening defeats in 2010. We’ll see this Saturday if this years edition has learned to win! Jimmy Dunn ( 14 ) was a 5'9" quarterback for the 1958 Florida Gators. He literally, in the words of Lewis Grizzard, "tore the hearts out of all Bulldog fans and stomped them suckers flat." With just over 12 minutes remaining in the game, Dunn rolled left and ran 75 yards to deal the Georgia Bulldogs a heartbreaking 7 - 6 loss in 1958. Sophomore Fran Tarkenton ( 10 ) was just starting to display his magical skills for the "Dawgs" in 1958. 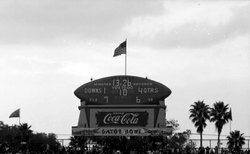 The Scoreboard tells the story in Jacksonville in 1958 as the Gators take a 7 - 6 lead over the Bulldogs in the fourth quarter. 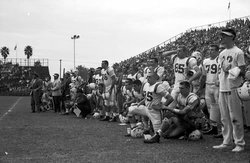 The Gator Sideline prepares to storm the field after a stunning win over the Bulldogs in 1958. The Dawgs had statisically dominated the game.